We sit down with Bianca, one of our jewellery instructors at Hatton Jewellery Institute, also founder and designer of Answer B. We learn more about her inspirations. ANSWER B follows a conceptual approach in design, adding a sense of delicacy in her creations. 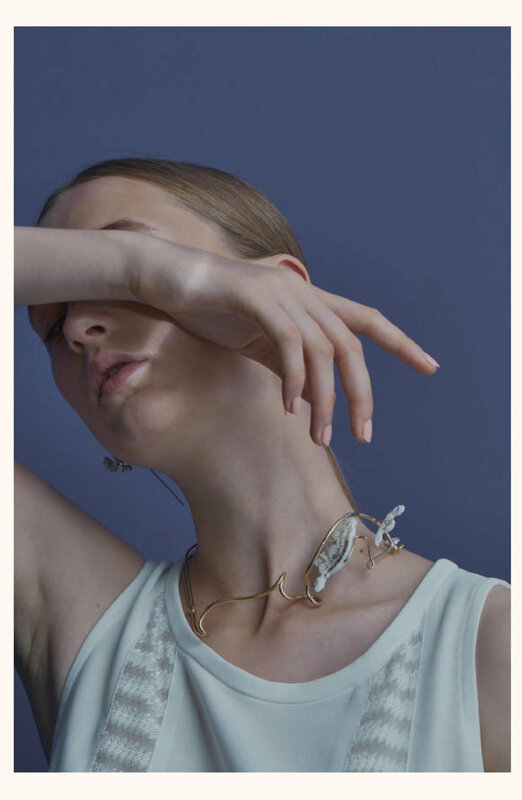 Inspired by the fluidity of natural beings and the structural mechanics of architecture, ANSWER B seeks balance between the two ends of organic and synthetic matters to build poetic jewelleries that flow along the body. I always loved making small accessories like bracelets and handbags.. During my MA at the London College of Fashion, I became fascinated with metalsmith, discovering all possibilities working with metal. Since then, I continue to learn new metalsmith techniques and create more jewellery pieces. My design style is a combination of fluidity on the body and construction within the piece. I always create to compliment the shape of the female body while focusing on the placement of different elements within one piece of jewellery. Each jewellery can be viewed as a mini sculpture which also makes the wearer looks good with confident, I think this defines the uniqueness of my work. Women who understand themselves.. women who realise their imperfections and embrace their flaws. Women who seeks beyond the minimal style. I want women to feel empowered when wearing my jewellery. As a designer, where do you draw your inspiration from/ what inspires you? I am always attracted to architecture and landscape and I like to include structures and negative spaces in my work. I am also inspired by all things natural. I like to recreate silhouettes and bring that fluidity in my jewelleries. I always work with round or square rods to create shapes and solder them together. My favourite tools are pliers and my favourite technique is soldering. For jewellery design, I love KOVA jewels, Anissa Kermiche and Andres Gallardo. I love how the designers use gemstones and interesting elements in jewellery, and how Andres Gallerdos uses his beautifully handcrafted ceramics in his designs. I usually start with a rough sketch, then will start playing with brass rods and materials to create forms. I will then try to imagine how it looks when I wear the design.. My designs change throughout the process. When a maximalist think it’s time to stop? It’s a clutch composed of 3 different types of wood in natural colours forming an ombre effect. I spent endless days and nights experimenting with the mechanical structure, and after 4 prototypes, I was happy with the results. This piece is exceptionally meaningful to me as it symbolises a learning journey, and I became very pleased with what I achieved. I started practising yoga and pilates two years ago. Since practicing I can see myself getting stronger and healthier and there is always something to work and improve on. I also become more aware and appreciative of my surroundings.